Ideally located below Constantia Nek, just moments from the bustling Cape Town city center, Constantia Glen is a picturesque boutique wine estate producing ultra-premium, cool climate wines. 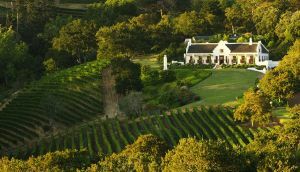 The 60 hectare property, situated at an altitude of 130-270 metres above sea level, has a mere 29 hectares under vine with production of Constantia Glen wines limited to 100,000 bottles per annum. The undulating foothills of the Constantia berg command hand harvesting practices, underpinning the hand crafted quality of the wines. Cold maritime breezes from the Atlantic, directly off False Bay, regulate the annual average temperature at a mild 16ºC. Dryland cultivation under these cool climatic conditions results in slow ripening, low yields with exceptional grape quality and favour concentration. This makes for crisp white wines and fresh, vibrant reds of great elegance and structure, setting the district apart from other South African wine producing areas.